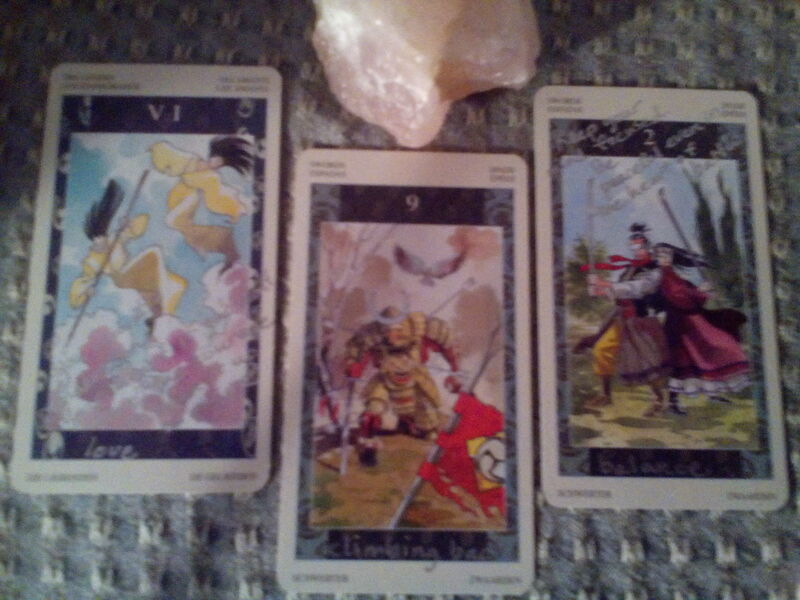 From the Samurai Tarot: The Lovers, Nine of Swords, Two of Swords. Why so many swords connected with lovers? You tell me. I think we both know the answer to that. The Samurai Tarot says of the Lovers, “You cannot understand your heart if you don’t have the courage to open it up to others.” For the Nine of Swords, it says, “climbing back.” Yes, CLIMBING back. And for the Two of Swords, balance: “Keep your mind focused. Be peaceful even in the heart of battle.” This kind of wisdom is why I love this deck so much. So much loss in the world today. And yet the energy feels right. It’s like a Tower moment: one of those things that many people hate to experience, but that takes them to a better place, ultimately. The universe knows what it is doing. Climate change? You know what, the Earth knows what it has to do. It just isn’t going to be that easy on the rest of us. We’ll have to cope. Lost lover? Guess what, now you have an opening for someone wonderful to come into your life. Someone who never would have appeared if you were busy being faithful to the jerk who just left you. Money problems? Oh, what a teaching we have here! You will live through it and thrive. These are the moments when we become so imaginative, so inventive, that we almost can’t believe our own ingenuity. Injury? Disease? This is perhaps the hardest of all. But — maybe the universe knows better than you here as well. Maybe you need time off and you wouldn’t have taken it otherwise. Maybe you had tension in a body part that wouldn’t release unless you broke that bone. Maybe there is something you need to work through here. At least consider the possibility. I don’t mean to be patronizing or to blame anyone for their misfortunes, truly. But what I want to say is this: misfortune — or, I should really say, “misfortune” — is more than just a misfortune. It’s a space clearing. It makes space in your life for abundance and love and goodness to come rushing in. If all that clutter that you were so attached to was still there, there wouldn’t be room for all the wonderfulness that is coming. Of course, there are other types of misfortune besides loss. But when it’s loss — it’s also a space clearing. Please, trust me on this. The universe knows what it is doing. And that means, by the way, that somewhere deep down inside, YOU also know what you are doing. If you don’t like what you’re doing, then ask yourself why you’re doing it at all.